Yesterday morning we were determined to recreate our favorite honeymoon breakfast. Chilaquiles are a traditional Mexican dish consisting of corn tortillas, green or red salsa or mole, eggs, and sometimes pulled chicken. I scoured the web for recipes and decided on one that warned: “There’s a lot of work involved with this recipe, but it’s worth it if you’re hankering for an authentic Mexican breakfast.” But it was our anniversary. What better way to spend it than sautéing tomatoes and jalapeños from our garden, baking tortillas, and poaching eggs? First we made a sauce seasoned with onions, garlic, jalapeños, cumin, and chili powder. 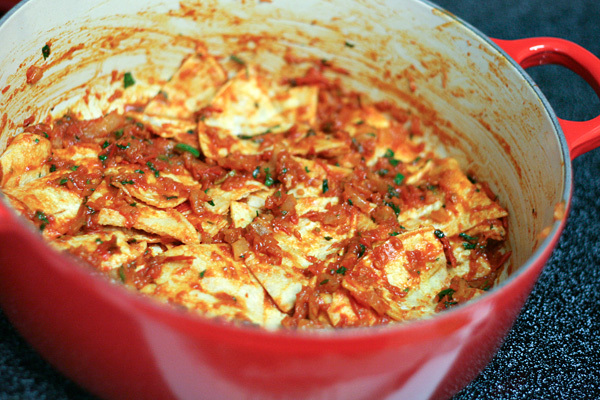 The flavors intensify as they simmer on the stove top with tomatoes and chicken stock. 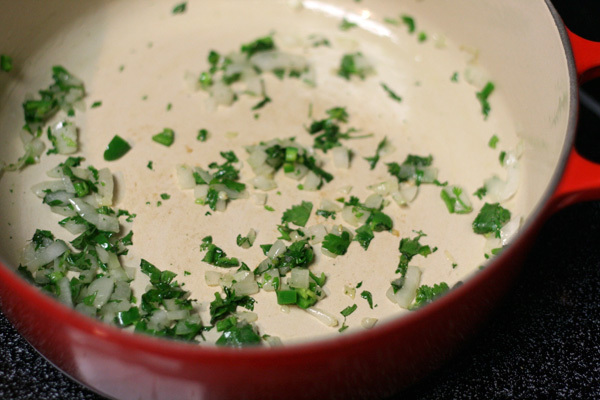 And this wouldn’t be a proper Mexican dish without cilantro, so we tossed that in, too. 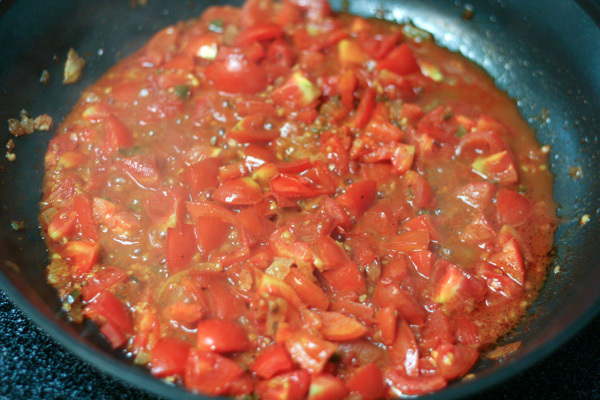 After almost an hour, the sauce cooks down to a thick, deep shade of red. This is when you throw it into a food processor. Sauté more onions, jalapeños, and cilantro and combine with the blended sauce — this time in a Dutch oven that can be transfered from the stove top to the oven. At this point it may be necessary to sample the sauce. Savor it and remember the sun and white sand beaches of the Riviera Maya, the kayaks and cocktails and cenotes. Gradually ease back into reality and into your Pennsylvania kitchen and add the corn tortillas to the pot. Another mandatory ingredient in south-of-the-border cooking? Cheese. Lots of it. 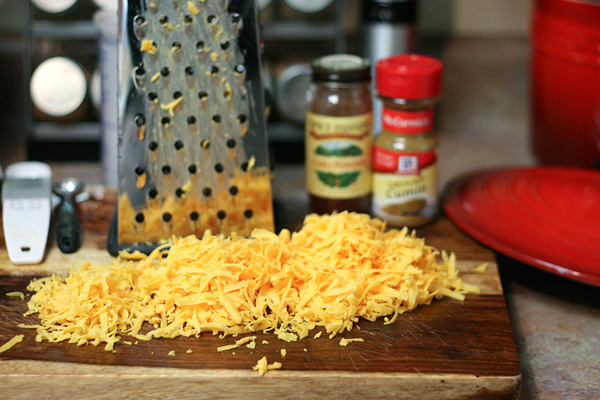 We used sharp cheddar. Cover the pot with aluminum foil and place it in the oven. Then you must make a decision. 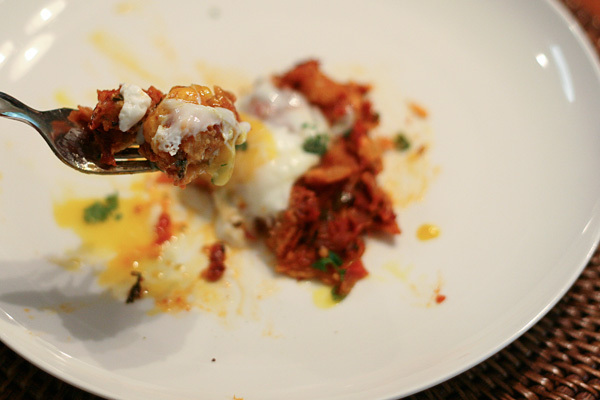 Should you finish the chilaquiles with a standard fried egg, or go outside your comfort zone and place a pretty poached one on top? It’s our anniversary, remember. Pretty poached egg it is. 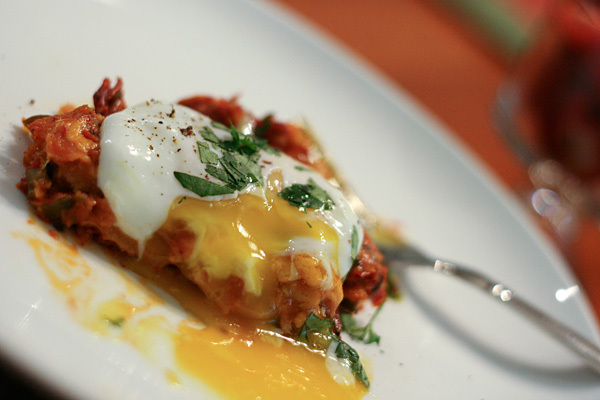 You can find great tips for poaching eggs here. 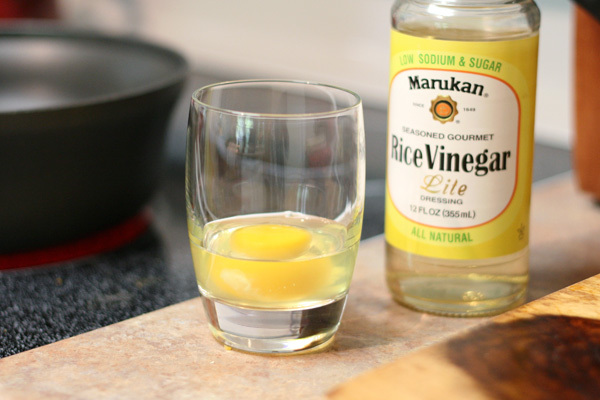 And we will confirm that the process is an easier one with a splash of rice vinegar. Finally. Finally! It’s time to assemble the chilaquiles. Sprinkle with chopped cilantro, sit beside your loved one, and savor each forkful. Promise to return to Mexico some day, but until then, celebrate the taste of it from thousands of miles away. Heat oil in a deep skillet over medium heat. Add onions and cook for 5 minutes until tender and translucent. Stir in jalapeño, garlic, and spices. Sauté for 10 more minutes. Add tomatoes and chicken stock. Stirring often, bring mixture to a low rolling boil for 1 minute. Reduce heat and simmer for 30 minutes over low heat. 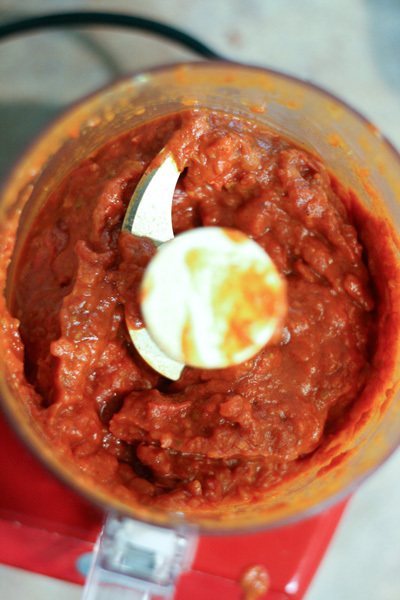 Remove sauce from heat and allow it to cool. Puree mixture in a blender until smooth. Set aside. 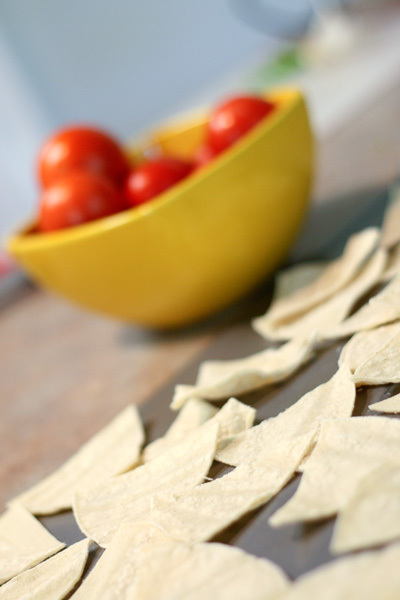 Place tortilla wedges flat on a baking sheet and bake for 2 minutes, just long enough to dry them out. Remove from oven and set aside. Keep oven set to 350°. 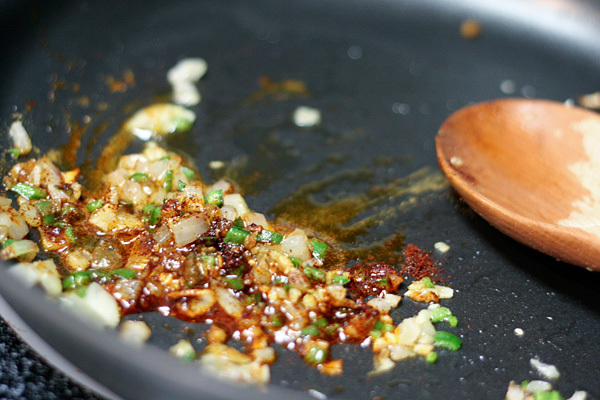 Heat oil over medium-heat in a large oven-safe skillet or Dutch oven. Add onions and cook for 5 minutes until tender and translucent. Stir in jalapeño and cilantro. Sauté for an additional 3 minutes. 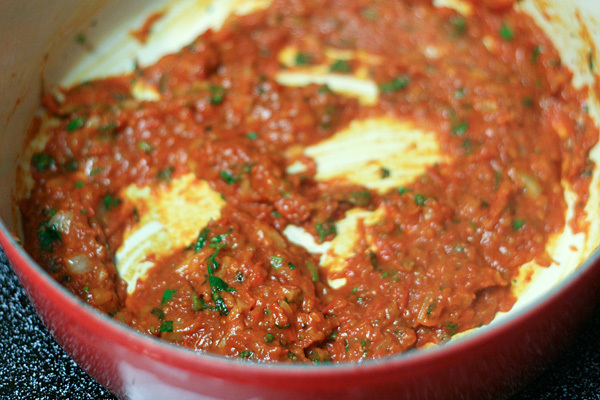 Add sauce as prepared above and bring to a simmer. Add tortilla wedges to sauce and stir until well coated. 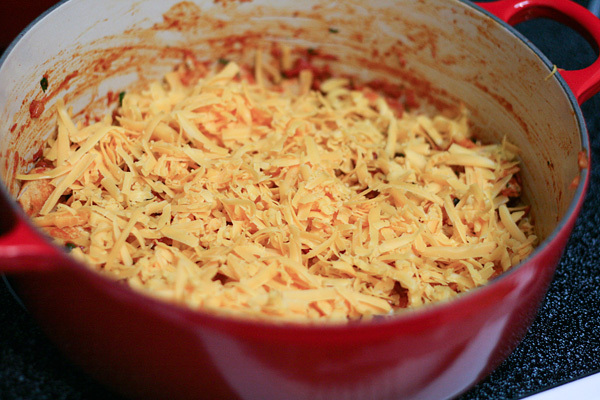 Remove from heat and sprinkle evenly with cheese. Cover with aluminum foil and bake for 30 minutes. 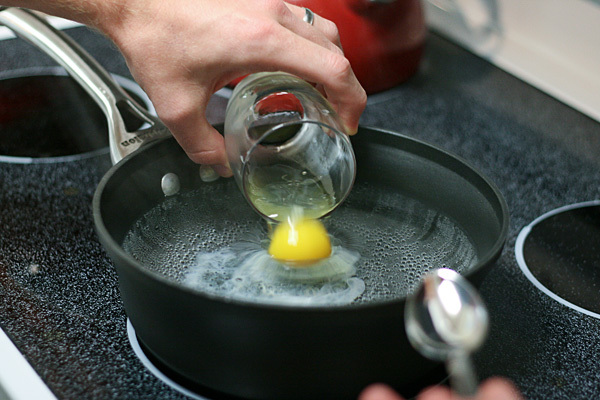 Towards the end of the baking time, poach (or fry) each egg. To serve, distribute the chilaquiles evenly among four plates. Top each serving with an egg. 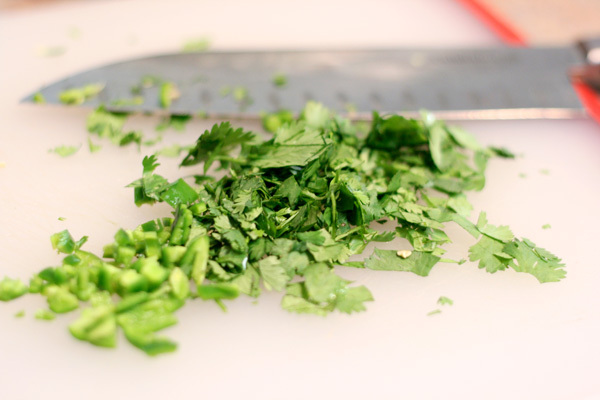 Add salt and pepper to taste and garnish with chopped cilantro. I love this recipe! 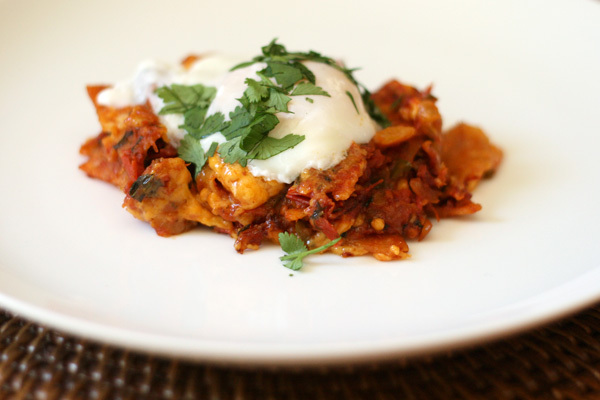 It’s my go-to recipe for chilaquiles for several months! Made it again tonight and everyone loved it. Thanks so much for sharing it!